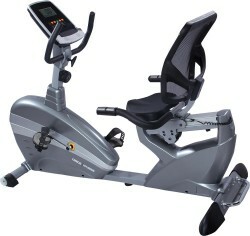 Recumbent Bike with 8 Levels Magnetic Dual Direction Resistance. Mechanical knob for horizontal Seat adjustment. 6 Kgs. flywheel offers smooth operation for longer duration. One Large LCD Display. Displays : Speed, Time, Distance, Calorie, Pulse.